Ready for WooCommerce Conference Day Two! Email – up to 65% of emails are opened on a mobile device. Companies using email to nurture leads generate 50% more sales leads at 44% lower cost. Put “buy” buttons directly in your email. Step 3: Get a sales tax license (permission to collect tax). You need one for each state you have nexus in. This is free in most states; it just takes a little time. Step 4: Collect – collect tax at point of sale. Step 5: File sales tax returns. TaxJar plugin for WooCommerce takes care of everything (calculates how much tax should be calculated, provides reports, and files returns automatically). Location settings: add each state individually so you can collect data on which states do better. Time settings: same thing, setup times of day so you can track what does better, and what days of the week do better. Then you can adjust bids based on that data. People may initially search on a mobile device, but then return on a desktop to convert. Make sure you install conversion tracking (contact thank you pages, order thank you page, account creation, newsletter signup, etc.) Set these up as Goals in Analytics. Google Merchant Center to run Google shopping campaigns. Set-up feeds from WooCommerce into Google Merchant Center. Also set up product data feed for Bing shopping. Scholarship Opportunity: Create a scholarship (e.g. : $1000) and send out press releases to all colleges and universities. Maybe 10-20 of them will pick it up and link to your site (high authority). Branding Videos – convey a certain feeling to customers. Give customers a wide scope of your brand. Build trust. How-To Videos – teach how to use products. You can fit multiple products into one video. People search YouTube all the time about how to solve a problem. Have videos that show them how (and sell your product at the same time). 370% product conversion boost when adding a video! Hope you enjoyed all the quick hitting info above. We know it’s a lot. We will summarize all of our thoughts on the event after it’s over. 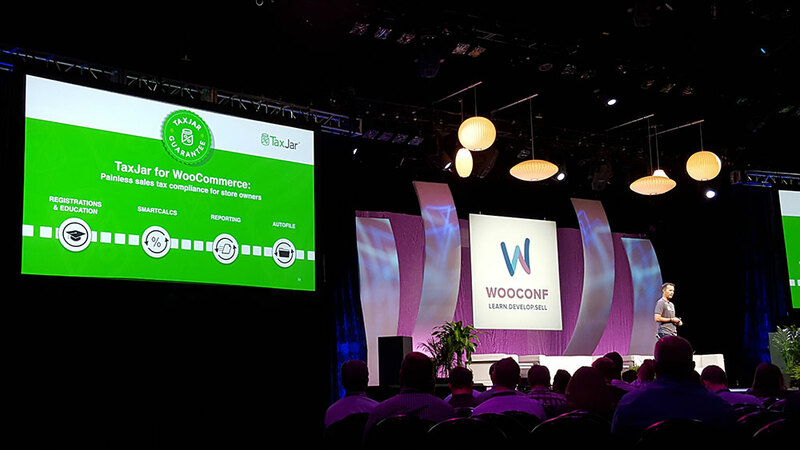 It’s been great fun so far getting to meet and talk with so many people who use WooCommerce in so many different ways. A few more sessions to go before we wrap up. More soon.